Digital Patrol is an antispyware security software from NicaTech Software that comes with impressive features and reliability. Digital Patrol able to detects Trojan Horses, spywares, viruses, worms, and malicious ActiveX controls and Java applets. The latest version of Digital Patrol has been updated to version 5.2, which powered by the NictaTech Anti-Virus Engine to promises better performance and robustness. Another impressive features of Digital Patrol is heuristic analysis of files, which make it ideal to be used to detect new, unknown viruses and Trojans. Digital Patrol also can helps users scans the most popular archive types and the self-extracting executable files (ZIP, CAB, RAR, ARJ, e.t.c.). Furthermore, Digital Patrol can downloads security updates automatically to keep Digital Patrol updated all the time. Removes the “active trojan” from a disk, even if it is blocking the file. Removes trojan files that are locked for writing. Manage all autostart information and memory processes. Scans system memory and autorun areas. Scans: archives (ZIP, RAR, ARJ, Microsoft CAB, Install Shield CAB) and mail bases (Outlook Express, TheBat!, PlainMain, e.t.c.). Digital Patrol support Anti-Virus Integration. Fill in the form and submit the details including name and a valid email address. A conformation email will be sent to the email Inbox. Note: The license key will be received within 24 hours. After completed download, just execute dp.5.2.24.setup.exe and click on the “Start” button. 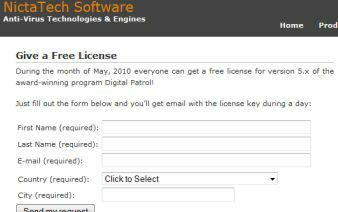 Once click the start button, go to “All program”, and select “Digital Patrol” for the “Digital Patrol activation wizard”, then enter the license key received to activate the software. Enjoy the free of Digital Patrol 5.2. 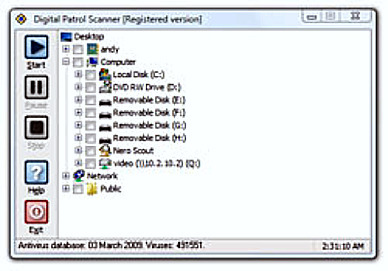 Digital Patrol 5.2 supports Windows 2000, Windows 2003, Windows XP, Windows Vista, and Windows 7.